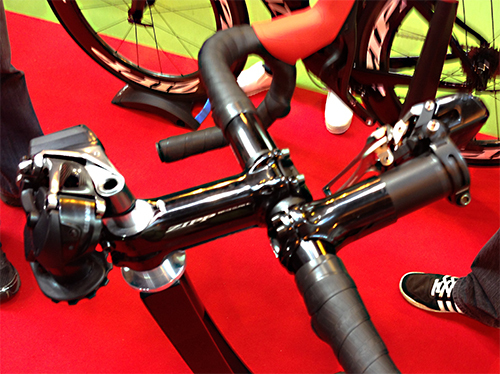 There’s been a fair bit of coverage of the new SRAM electronic groupset in the cycle press recently, so it was interesting to see a set-up in the flesh at the Cycle Show last week. I have yet to switch any of my bikes to an electronic shift system, but having played with these on several bikes, I’ve been impressed by the efficiency of the offerings from both Shimano and Campag, and I admit that I’ll have to bite the bullet at some point. What SRAM have done is throw some lateral thinking into the design of their electronic system and potentially made a change that the others might well follow. While the shifting systems from Shimano and Campag mirror their manual counterparts, with the right hand lever shifting the rear derailleur up & down, and the left hand lever serving the front derailleur, SRAM have torn up this base premise and potentially created a simpler solution. With the SRAM system to shift the rear derailleur up a gear you press the right hand lever, and to shift down your tap the lever on the left. Really simple, so no complications with having two buttons each side to fumble with fingers and thumbs, just a tap with your fingers on either side. That’s the rear derailleur dealt with, so how do you shift between chainrings at the front? Well that’s done simply by pressing both levers at the same time. Press them together and you shift from the small to the large chainring, press them again and you shift back to the small ring, and so on. It’s clear that this simple principle won’t work for triple chainsets, but it’s probably fair to assume that those set-ups will stick with the manual ‘cable’ systems. It takes a little time to throw off the old thinking, but this idea is surprisingly intuitive and I would expect the principle to be adopted by one of the other two systems in the future. 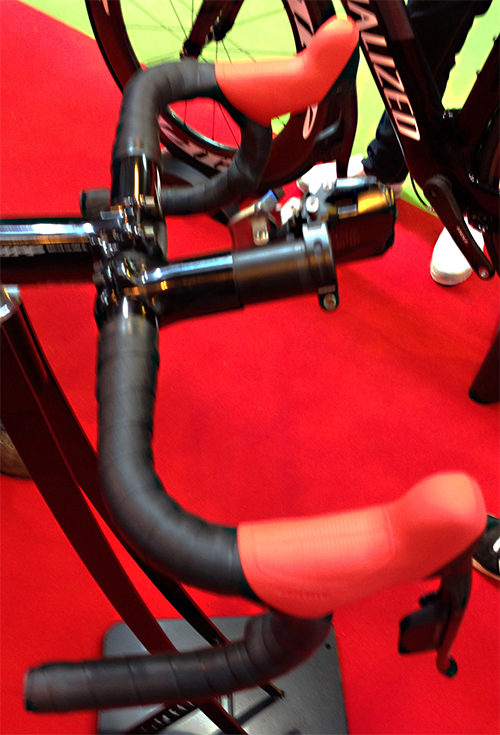 So with one sweep, SRAM have done away with a button on each side… they’ve also done away with much of the wiring, as their system works wirelessly. This requires each of the shifters to have a battery, but they assured me that during their tests, because the shifters were only effectively on/off switches, the batteries had yet to be replaced. With regards wiring, this was only necessary to incorporate small switches, I think they called them ‘blippers’, to allow you to change gear from different positions – that could be under the handlebars, so you could change gear from a ‘touring’ position, or located on your tri-bar set-up. The mainstream press have started to pass comment on how the SRAM system compares to their competitors, and there’s a suggestion that shifting may be slower, but in terms of usability I think that this represents a significant shift in thinking that will appeal to a broad range of users. Note – Apologies for the poor quality of the images, unfortunately the iPhone decided it wanted to focus anywhere other than the eTaps.